Have you ever had a friend who seemed more into the friend they thought you were than the friend you are? Or the friend they want you to be perhaps? Or maybe you’ve had the niggling feeling that your friend actually doesn’t much care who you are, as long as they can cling to the illusion that you are everything they want you to be? It happens in love stories all the time, and friendship is no different. We meet someone and we are drawn to them. Sometimes we can list the qualities we are drawn to, and other times maybe it was simply how that person made us feel about ourselves that has us hooked. We start to view them through rose coloured glasses or associate them with the positive feelings we are having. I have experienced this on both sides. I have seen in people what I wanted to see instead of what was actually there, and I have had people try to force me to be what they needed me to be instead of letting me be what I am. Neither thing worked out well. I have had friends who seemed endlessly disappointed with me, and no matter how hard I tried, I couldn’t seem to show them what it was they wanted to see. The problem being we were both so focused on what they wanted, that we couldn’t accept that I wasn’t it. I have had friends who needed me to validate them, their lifestyles, choices and relationships, but who couldn’t handle it if I was unable to agree with them on something along the way. They didn’t enjoy me as much as they enjoyed the positive reflection of themselves they saw in me. I have had friends who needed a counsellor, but who were unable to listen or hear anything I actually said, about themselves or myself. I have had friends who value qualities in friendships that I just don’t offer. Having a conversation recently with one friend about her other friend, she commented that although this woman could be hard work, she was valuable because she was always there to loan money or other acts of service at a moments notice. When I probed her for more information on what she valued about this particular friendship it dawned on me that she values everything I’m not as a friend. What I mean by that, is explaining that the other person is meeting a need we have, without accusing each other of not meeting that need. When I realise for example that she values someone who loans her money, I instantly realise I’m glad she doesn’t come to me for that kind of support. Similarly, when she realises I am drawn to women who like to go out for an evening, she is relieved I don’t pester her to find babysitters to oblige that need. It isn’t always easy to identify when you are pushing someone to be something, or even everything, that they aren’t. All I can tell you is to look out for feeling disappointed in a friendship, sometimes perpetually. Identify what it is that you hope they will do for you that they aren’t and what need is reflected there. Is your friend not making time for you? Do you need to feel more important to someone? Is your friend genuinely a super busy woman? If the answer is yes, look around you for someone less busy, and see if they will make more time for you. If they do, your need will be met, and your ability to appreciate the time your initial friend makes for you will be tenfold. Sometimes someone does meet a need for a time, and then they suddenly stop. This hurts. We can cling to them and be angry and resentful that they have changed. Alas, people do grow and change. If we are feeling dramatic about it, perhaps it is because we are not growing with them or in the same direction as they are. Most likely it is because we associate that feeling with that person. They were always “our person” right? We need them to stay that way. The issue isn’t with your friend, but with your now unmet need and aggravated expectation of them to fill that need. The problem with needing a certain person to make you feel a certain way is that then you need that person to be happy! It’s uncomfortable to admit, but there are other people who can make you feel happy, heard, validated, loved, excited, and supported or whatever else it was that this one friend made you feel. Let go of the idea that only that one person can make you happy and you will be instantly happier! The veronica’s song “Everything I’m Not” comes to mind. “The girl, that you want, she is tearing us apart, because she’s everything, everything, I’m not.” If you find that someone is disappointing you, or you are constantly disappointed in them, that is a pretty good sign that you are asking too much of that person, or that they are asking too much of you. To my wonderful friends; thank you for taking me as I am, for accepting everything that I am and overlooking everything I’m not. I’m so glad you have other people in your lives to fill the cracks in what I am lacking, and I am so grateful to all of you for meeting the needs that you do meet of mine. Don’t ask or expect anyone, including yourself to be anything, let alone everything that you are not! 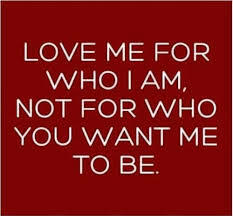 Know who you are and who they are and let that be enough for you both. Older PostA friend in need is a friend indeed!